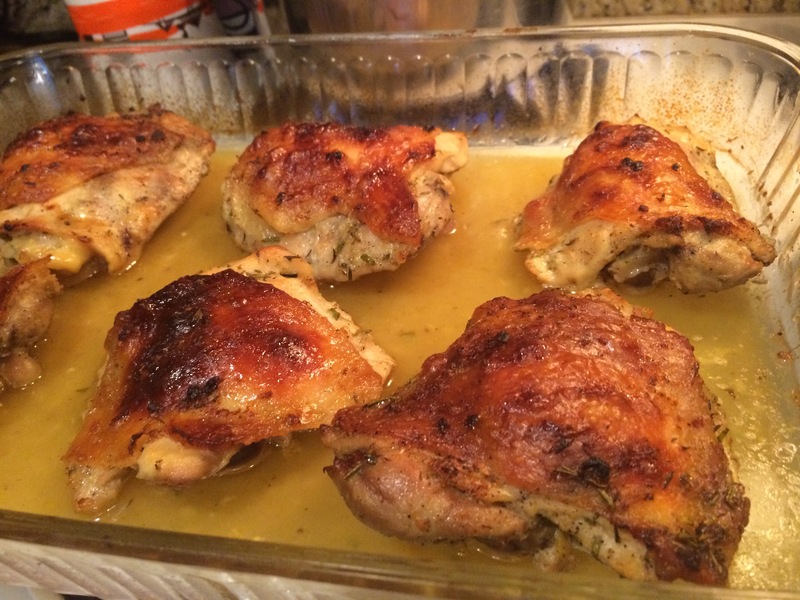 New Menu Monday- “Snicker Snacks” Chicken becomes Lemon Chicken- Two Recipes! 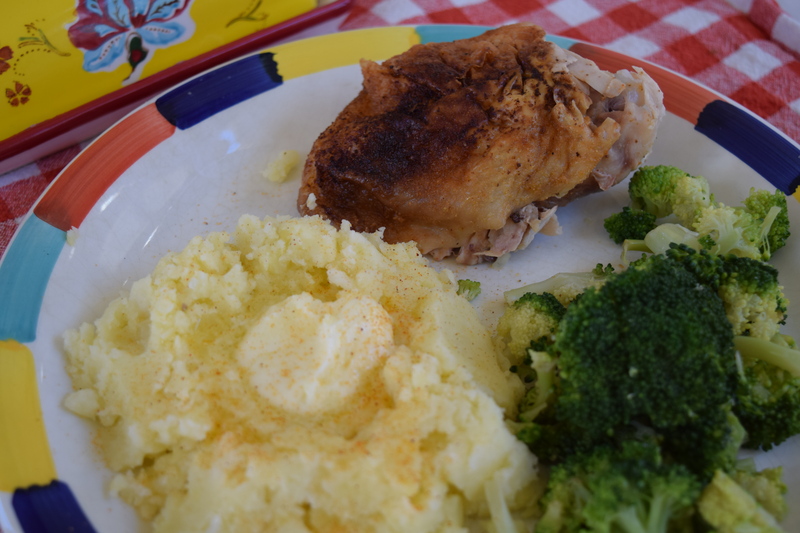 Our favorite baked chicken, with mashed potatoes and broccoli. This is super easy- In a 9″ x 13″ baking dish, place a quartered chicken (or 8 chicken thighs), skin side up, brush with a mix of 2 tablespoons melted butter and 2 teaspoons Worcestershire sauce, and then sprinkle with onion powder, garlic powder and Lawry’s seasoned salt; bake at 400 for 25-30 minutes, until the skin is nice and crispy. We like this served with any vegetable side and mashed potatoes, usually. I think these are the best staple seasonings- Penzey’s Toasted Onion Powder and California Garlic Powder, and Lawry’s Seasoned Salt. Honestly, these are what I reach for every day. Bake it long enough, do not be afraid, and you will be rewarded with a lovely crisp skin glazed in lemony goodness. I liked this recipe, even though I overcooked it a bit in the end. I think it is because my thighs were of different sizes. That does sound like a personal problem, but I assure you I am referring to the chicken thighs here. Ha. The Boy liked the usual “snicker snacks chicken” better, The Husband liked it, International Boy liked it well enough, I gave it a Seal of Approval, “I’d Make This Again” Vote. I really liked the fresh lemon flavor… nice and bright. Yum! I highly recommend following the recipe- do not skimp on the fresh, real lemon zest or juice, and use fresh garlic. They really make this dish shine. Great recipe, Annies-Eats.com! Ingredients assembled… Annie’s-Eats.com recipe printed out. Here’s mine! Garlic + Lemon = Dee-lish! 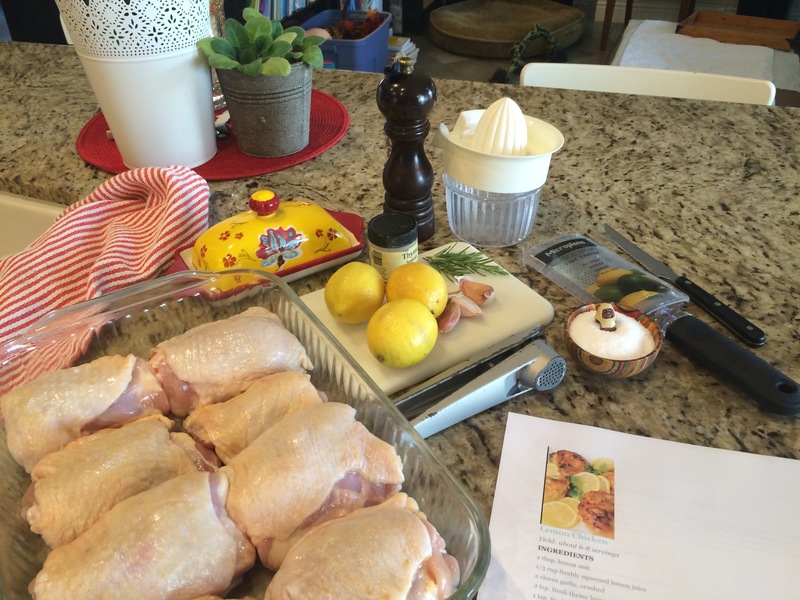 Posted on September 14, 2015 Categories Food and DrinkTags Annie'sEats.com, baked chicken, food, garlic, lemon, Lemon Chicken, Penzey's Spices, recipes, SnickersnacksLeave a comment on New Menu Monday- “Snicker Snacks” Chicken becomes Lemon Chicken- Two Recipes!